When we think of the 70’s we think of tie-dye, peace, love, and happiness. Who would have thought that we could also thank the 70’s for the controversial topic of homework! Homework. Just the word rouses deep emotion in teachers, parents and students. The 70’s brought us word processors, digital watches and cameras and the pocket calculator. Technology hit the ground running. That sent educators a very clear message. American schools were going to have to raise the stakes to educate students that would be prepared for the global competitiveness they would face in the future. Increasing homework to increase student achievement seemed like a logical place to begin. By 1999, our country was feeling the stress of homework overload. A TIME cover in 1999 read: “Too much homework! How it’s hurting our kids, and what parents should do about it.” Seventeen years later, we are still asking the same question. The drive to increase student achievement has only intensified over the years. The result being that our children today face more homework than ever. Teachers, parents, and students are all at their breaking point! This year, many teachers simply had enough and attempted to end the homework madness by eliminating homework altogether. Taking such a drastic measure spread like wildfire. Many teachers and parents were thrilled to join the cause. After all, much of today’s research proves homework is doing more harm than good. In 2015, The American Journal of Family Therapy published a study showing too much homework leads to family stress, negative attitudes toward school, lower self-confidence, harms the development of social skill and hurts a child’s quality of life. The study had even more shocking results of homework overload on high school students. High performing high schools often expect students to complete more than 3 hours a day of homework a day. Under these conditions, 80% of these students suffered from stress related symptoms including headaches, exhaustion, and ongoing health problems. A majority of these students admitted to using drugs and alcohol to relieve stress. Research clearly proves too much homework has adverse effects, but how much homework is too much? The National Education Association and the National PTA both support the standard of limiting homework to 10 minutes of homework per grade level, beginning at first grade. The Journal of Experimental Education suggested that homework be limited to 2 hours or less for high school students. Clearly, too much homework is not helpful; it is actually hurting our students. Most people quickly agree with those findings, but are left asking questions. What about assigning less homework? Many people are not ready to consider eliminating all homework. After all, practice makes perfect. Doesn’t some homework lead to increased student achievement? The findings are complicated and vary by age. Research suggests that students from kindergarten to 7th grade only see academic gains when homework assignments adhere to grade appropriate time restrictions and allow students to complete classroom tasks or review information for a test. Young children can use their after school time more wisely with family, sports, hobby and building relationships. Research seems to support “quality” homework for students in 8th-12th grade, but completed in 2 hours or less, as helpful. Cathy Vatterott, the author of Rethinking Homework: Best Practices That Support Diverse Needs, defines quality homework as assignments that exhibit five essential components. They must involve appealing and personalized tasks students are capable of doing on their own, having a clear purpose, which allow students to efficiently demonstrate subject knowledge, Vatterott supports eliminating homework until students reach 4th or 5th grade. Kathy Ruhl and Charles Hughs from Penn State University have researched the effectiveness of homework, specifically when dealing with students with learning disabilities. 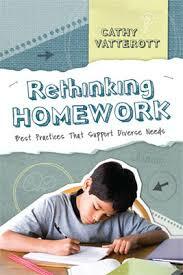 Their research supports that homework can be benifical to all students when these practices are put in place. After decades of researching the correlation between homework and student achievement, it seems like we come to the same conclusions we so often come to when faced with difficult situations. It started with good intentions. Quality vs quantity wins every time. There is a time and place for everything. Finally, yet importantly, life is a great balancing act.